The Seaside Residences has truly one of the most attractive condominium locations in Singapore. It possesses a rare combination of attributes that should excite lots of interest when it launches for sale in early 2017. 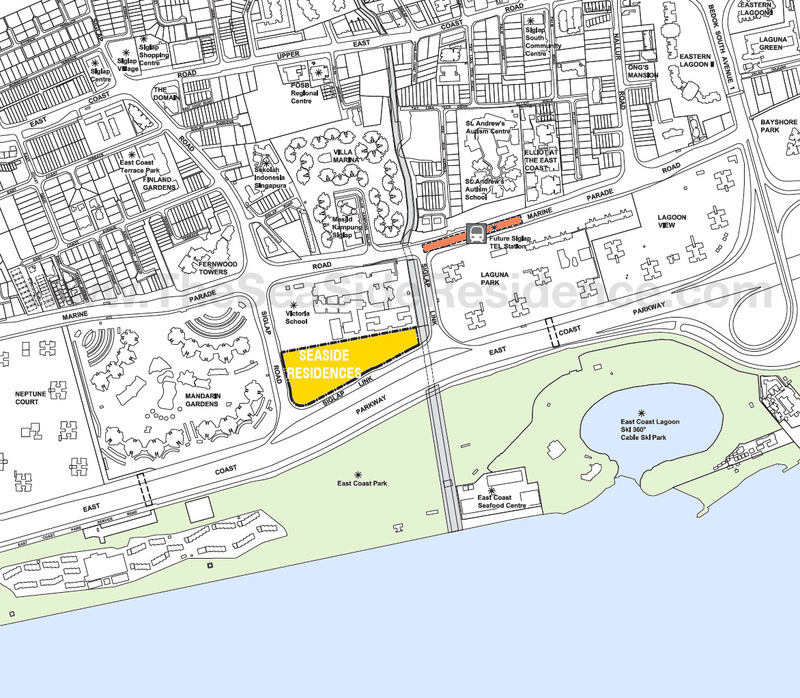 For a start, it has a wide sea-view frontage, directly facing East Coast Park and completely unblocked. It is also just 250m or 3 minutes walk to the future Siglap MRT Station. In addition, Seaside Residence will be the first new condominium with full sea views to be built along the East Coast in the last 15 years. Analysts expect a strong take-up rate, as there is hardly any competition due to the lack of supply pipeline here. 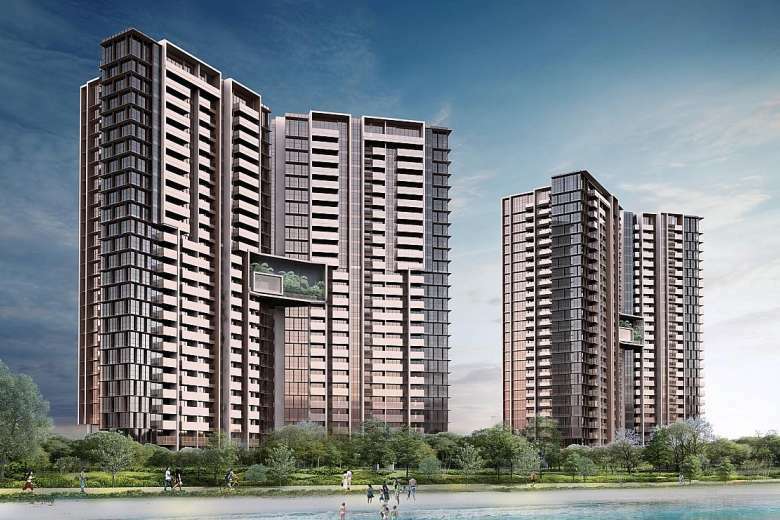 A consortium led by top developer Frasers Centrepoint will develop Seaside Residences. This JV comprises Frasers unit FCL Topaz, with Sekisui House and Keong Hong Holdings unit KH Capital. The Frasers-Sekisui House partnership has developed some nice projects in the past, like eCo @ Tanah Merah, Boathouse Residences and Watertown. Frasers is known for quality design and functional layouts. Keong Hong, a home-grown contractor with a track record of quality work, will undertake the construction. The Seaside Residence will stand tall, 27 storeys high, in 2 residential towers. Many of its 843 units will enjoy sweeping sea views. Its location at Siglap Link in the heart of East Coast is between 2 major towns, Bedok and Marine Parade, with malls like I12 Katong & Parkway Parade. And lining the roads from Siglap to Katong is a string of shophouses, dining outlets, bistros & hipster cafes that give this place a vibe & charm of its own, similar to that of Holland Village. Do arrange to view the showflat if you might want to live or invest here. A home in a private residential enclave, in one of the most desirable parts of Singapore, not too far from the city centre. Via East Coast Parkway (ECP) it is a short drive to Raffles Place and the Marina Bay Financial District, and to Changi Airport. 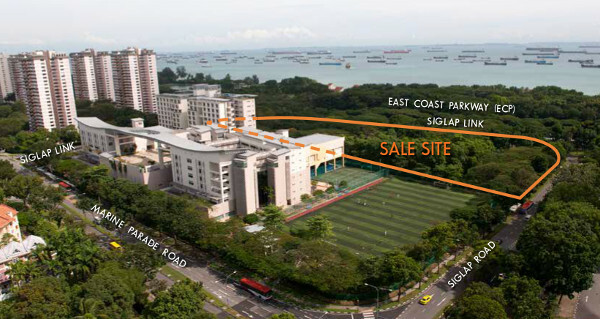 South-facing units get unblocked sea views and East Coast Park views, a rarity in Singapore. It is hard enough to get unblocked views without facing another building, let alone panoramic views of the sea and beach like this. The north of the site is relatively unblocked too. It borders the Victoria school site, half of which is open field, and the other half the mid-rise school building. So both sides are pretty much open. Very good for wind flow. Residents will have the joys of living by the beach. 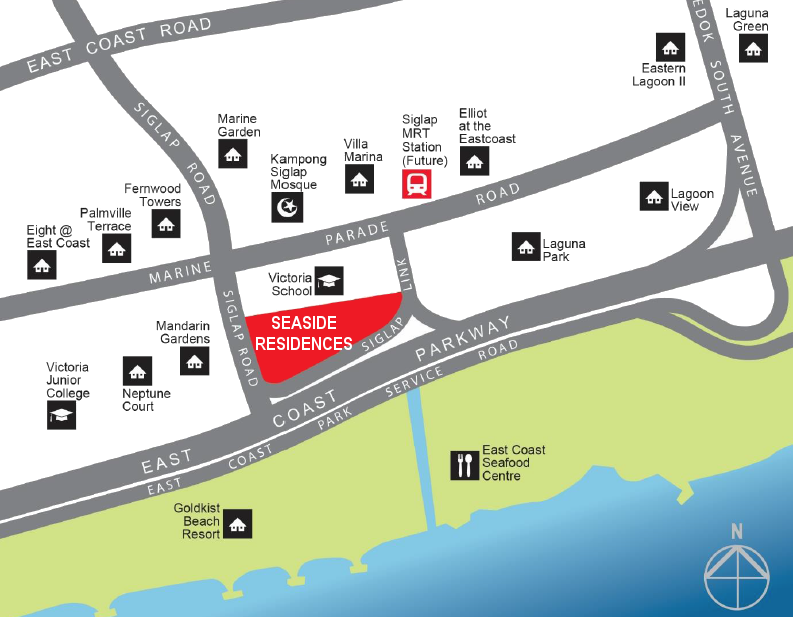 East Coast Beach is just across the road from Seaside Residences, accessible directly & safely via an underpass. Go for a swim, take a run along the beach, or just relax and listen to the waves. Seaside Residences is in a mature estate, well supported by amenities & one of the highest concentrations of top educational institutions. So a beachfront lifestyle does not mean having to forego the conveniences. Siglap Centre, Siglap Shopping Centre and Siglap V (with a Cold Storage supermarket), are 650m up Siglap Road. The Katong / Siglap / East Coast area is home to some of the most well known eateries and food joints. And for seafood lovers, the East Coast Seafood Centre at East Coast Park is across the road, by the beach. And of course, come 2023 when the Thomson-East-Coast MRT Line completes, there is the sheer convenience of having Siglap MRT Station just 250m, or 3 minutes walk away. Please register here if you would like us to keep you updated on the Seaside Residences launch. One of the most attractive things about Seaside Residence has to be its location, in the suburb of Siglap. Siglap, like the other east side hubs of Katong and Joo Chiat, has a distinctive charm and character of its own, composite of pleasantly laid back neighbourhoods and food and beverage joints in all sorts of nooks and corners. It is one of the most sought-after areas to live in, in Singapore. The residential area here is composed entirely of private housing, either condominiums or low-rise landed houses. It is home to mainly upper-middle class families, often long time residents who would never consider moving elsewhere. Even newcomers are drawn by the fact that it is just a 20 minute drive from the CBD, while yet retaining a pleasant domestic charm. What draws people to want to live here? Perhaps a composite of factors. There is a certain quaint flavour that permeates the streets of Siglap – a laid back casualness and neighbourliness, that invites you to chill out and relax. While it is a relatively quiet neighbourhood, it has earned a reputation as a hip place for food. 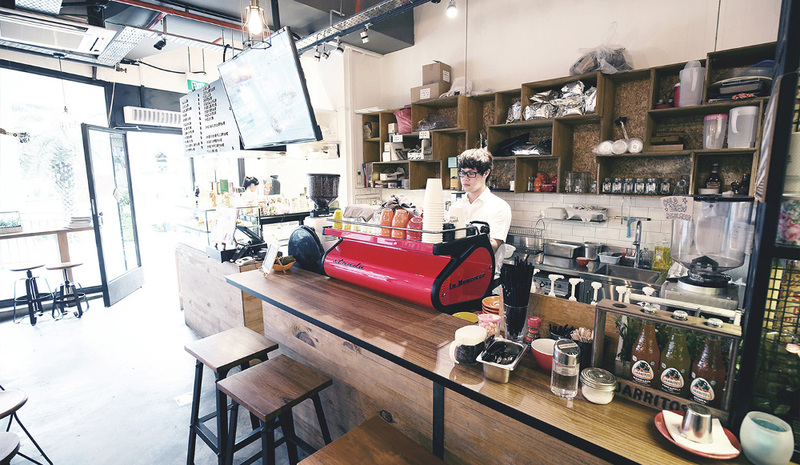 Thanks to the proliferation of cafes, bars, and restaurants that have sprung up along major roads, in old shophouses, and in malls like Siglap V.
Some of the most popular outlets in the area include Udders & Kook Ice Cream, Megumi Japanese restaurant, Craftsmen Speciality Coffee at Siglap V, or The Royals Cafe. Then we have the old favourites like Vie Bar on Upper East Coast Road, Soy Eu Tua Coffeeshop, and Indian Curry House. Part of Siglap’s appeal lies in its nearness to both Changi Airport and the city, as well as to some of Singapore’s most reputable schools, like Tao Nan School, Ngee Ann Primary, CHIJ Katong Convent, Victoria School. Great for families. Another of Siglap’s attractions is that the adjacent suburbs provide lots of amenities. It is right between Marine Parade and Bedok, two good areas for shopping, food and other needs. There is a generous range of leisure options too. Siglap is also one of the few places in Singapore that can command full sea views and quick access to the beach. No major developments have taken place in Siglap for some time now. But that is set to change. Firstly, it will finally get an MRT line, the Thomson East Coast line (TEL), that will make a stop here at Siglap station. Siglap and the East Coast area have been well supplied with bus services, and the lack of a train line has not dimmed its desirability to residents so far. 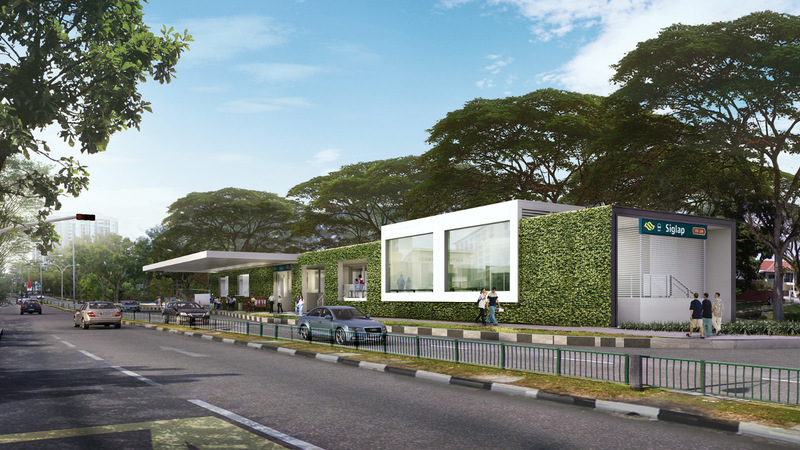 But the coming of the Siglap MRT station, expected to complete around 2023, should make this area even more popular, and boost its property values further. The other change is the launch of Seaside Residences. Siglap has not had a major new residential project since 2001, 16 years ago. So there is likely to be pent up demand for new homes with full condominium facilities, in this location. Add to that the fact that Seaside Residences will be just 3 minutes walk to the future Siglap MRT station, and we have a very nice pairing of factors here. Please register here to receive updates on the Seaside Residence once available. The Urban Redevelopment Authority (URA) released this plum Siglap site for sale by public tender on 26 November 2015. The tender closed on 14 January 2016. It drew bids from 8 developers in a tightly fought contest that included some of the biggest names, like Guocoland, UOL, City Developments, and a Frasers Centrepoint consortium – testimony to the site’s various merits. The FCL-led consortium of Frasers’ unit FCL Topaz, Sekisui House & KH Capital lodged the highest offer of $624.18 million, roughly $858 per sq ft per plot ratio, for the land. FCL’s winning bid of SGD$624.2m was just 4% higher than the next highest bid by CDL, and barely 7% above the median price across all 8 bids. In fact, the top 4 bids were all above $800 PSF/PPR. This very tight margin probably reflects the value that developers see in the site, and their bullishness on it. Analysts point to the site’s attributes, like its unblocked sea views, proximity to East Coast Park and Katong and an upcoming MRT station, and to East Coast eateries and the city. There are also no new projects of this kind of size in the neighbourhood. The last time a similar site was sold nearby, was in 2001, that became the Cote D’Azur condominium. Given the land cost of $858 per square foot per plot ratio, Mr Nicholas Mak, head of research & consultancy at SLP International Property Consultants, estimates breakeven at S$1,370 per sqf to S$1,480 per sq ft (PSF). Other analysts have estimated a break-even of about $1,320 to $1,350 PSF. This could work out to an average price of around $1,550 to $1,650 PSF. But expect quite a large difference between pricing of sea-facing units, vs those without sea views. Note: The published average pricing of a project typically refers to pricing of its mid-floor & mid-size units, like 3 and 4 bedders. Average prices of 1 and 2 bedders would be higher than the average stated PSF of the project. Analysts point to Costa del Sol as the most comparable to Seaside Residences, among existing projects, in terms of site attributes and location. In the last 3 months of 2016, resale units there transacted at between $1,196 to $1,268 PSF. However Costa del Sol completed in 2004, and its site has a balance of 81 years on its lease. If we extrapolate based on a full site lease, and taking into account the cost of renovations to achieve the same “new building” standard, then the price levels would be very similar. So although the projected pricing is higher than for surrounding older condominiums, sales is likely to be boosted by its combination of unique attributes. Another strong point that will boost sales is that there is no “supply fatigue” in this area. Unlike other locations that has seen a string of sites launched in the last 5 years, this site is a rarity in the vicinity. See this report for a news article on the sale of this site (opens in new window). Please register here to receive updates on the Seaside Residence prices once available.